The Reasons for the Growing Demand of Property Accountants There are various reasons why the different parties in the property industry such as housing associations, architects, renting agents, owners, and developers, are looking to hire property accountants. With the motive of making the most of their property and also to protect themselves from the consequences of not adhering to the compliances, more and more people are hiring specialist property accountants. This holds true whether you are someone who lets out the property, develop the property for renting purpose, or in any way related to the construction business as an architect, surveyor, designer, contractor, or owner. You need to remember that there are tax regulations that must be strictly followed and there are also tax benefits that you can get to enjoy but only if you hire experts to assist you. An expert property accountant will have complete knowledge of the property tax law and variations made to it. Thus, it can rightly be said that property accountants are needed not just for ensuring compliance but also to restrict the amount of taxes to be paid. Mentioned below are a few benefits of hiring property accountants. 1. To keep a proper record of rental accounts. It is only by having proper rental records that you can judge the success of your business of buying and letting property. It is impossible to keep a track of everything beginning from repair materials, cleaning materials to occasional missing out on rent. However, you must have a complete and proper record of what goes in and comes out of your business every month. A reliable property accountant will help you with just that and a lot more to enable you to maintain proper rental accounts. 2. Latest financial updates. These days property accountants make use of the latest software for offering their services. This software provides you a precise picture of the financial standing at all times. This is essential otherwise you cannot judge whether you are earning profits or suffering losses. This is also helpful for ascertaining whether you are charging low rent or spending too much on maintenance, and more. So, make sure you choose a property accountant who can provide you an accurate picture of all the properties that you are dealing in. 3. Claim rebate on self-assessed expenses. Are you aware that you can offset your loan interest against you self-assessed tax bill? If you have made the efforts to carry out necessary paperwork and advertisements from your premises, you can enjoy some amount of tax relief. Expert property accountants know exactly what savings you can be made in your case and they will also prepare a self-assessed tax return on the same basis. 4. Capital gains tax. Even if you purchase the property with the primary motive of renting it out, you may feel the need to sell it at some point. As per the taxation norms, any property that is not your primary place of residence is subject to Capital Gains Tax. In this scenario, Government takes a share of your profit as a tax. An experienced property accountant will help you to plan for such an event beforehand. 5. Anytime assistance regarding properties and finances. The biggest advantage of hiring a property accountant is that an expert is simply a call away. You can call them regarding important financial decision such as â&#x20AC;&#x153;Should I invest in another property?â&#x20AC;?. 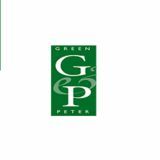 Your property accountant will provide you the best advice which will help you to make an informed decision. These are just a few benefits of hiring property accountants for assistance. 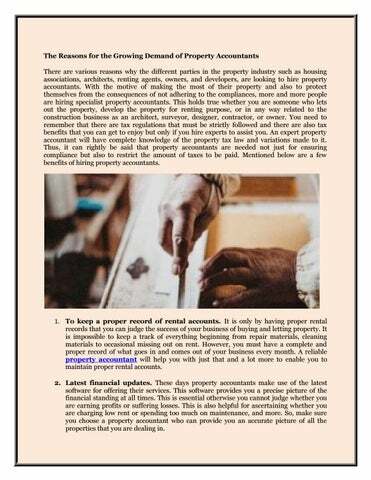 However, to avail these benefits you need to ensure that you hire a credible property accountant. Seek recommendations and referrals and then only go ahead with hiring someone.